A mysterious sarcophagus made of black granite was discovered in the Egyptian port city of Alexandria. 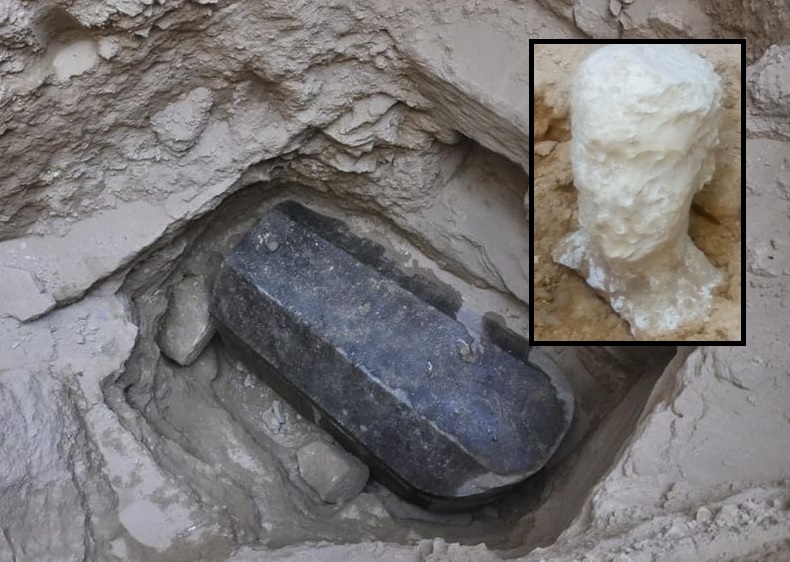 Archaeologists unearthed the almost two meters high and three-meter long sarcophagus yet do not know who or what is inside. It was found along with a large head carved of alabaster that only added to the mystery although archaeologists think the head may offer some insight into who's remains are inside. The alabaster head was seen poking from the dirt at a construction site and drew the attention of Egypt archaeologists. When they arrived at the construction site and more earth was uncovered, a layer of mortar was discovered between the head and the lid of the sarcophagus indicating it had remained untouched for thousands of years. The find has not only sparked excitement in the archaeological community but also among the internet. Social media users were quick to speculate on the contents with theories ranging from the "Nyarlathotep, the crawling chaos," to a "hoard of supernatural scarab beetles and a powerful undead king". My own theory is that there could be surviving bacteria from thousands of years ago which could turn into a deadly virus just like bacteria recently found hidden in ice that released ancient viruses. It is possible such a pathogen could be so old that modern humans are no longer equipped to deal with it? Ayman Ashmawy, the head of ancient Egyptian artifacts at Egypt’s ministry of antiquities said, "We are hoping this tomb may belong to one of the high dignitaries of the period. The alabaster head is likely that of a nobleman in Alexandria. When we open the sarcophagus, we hope to find objects inside that are intact, which will help us to identify this person and their position." It will take some time to open the sarcophagus since much work must be done prior to opening the ancient artifact. "It’s risky to open it directly – we need to prepare," Ashmawy said. "It’s difficult to move it intact and open [it] in a museum. It’s five meters underground and the whole thing weighs over 30 tonnes. The lid alone is 15 tonnes." A team of engineers will visit the site and provide heavy lifting equipment and structural support that would allow archaeologists to excavate the lid. Until then, the internet and archaeologists will have to continue speculating as to the contents of the mysterious, ancient artifact. Never forget that when Tut's remains were disturbed nearly everyone involved died within weeks. Supposedly one of the lead archaeologist's dogs even kicked the bucket. Started limping backwards, a few yelps and keeled over. My money is on Nyarlathotep or something similarly sinister. Not enough people up on their Lovecraft to know better than to undertake something this foolish, but hell, couldn't be much worse than the games with reality they're playing at CERN and KEK (yes, there's a Japanese facility working on reality-warping science that's callled KEK). 2000 years ago isn't "ancient Egypt". It was already conquered by the Greeks by then. It technically might not even be an Egyptian person inside. But how did they manage to make such a heavy sarcophagus so many years ago that now so many technical workers are needed to take it out? How did they manage to rise it, put on the catafalque, bring to the grave, rise it again and put so deep not turning over? It seems to me that they were certainly not people, but maybe the descendants of the Atlanteans, so that inside may well be one of the last Atlanteans, moreover since their library is hidden under the paw of the Egyptian Sphinx, and the pyramids most likely were built by the Atlanteans, but not the Egyptians. Even if there are remains of a man in the sarcophagus, still it were not people who buried him.